After a baptism or christening, it is a common practice to have a lunch or dinner for families, friends, godparents, and other guests. With this, they need a caterer or other food service provider that will do the food preparation, decoration of the venue, and setting up the tables, chairs, and all other matters regarding the baptism. Because food is among the top priorities for both the host and visitors, it is fitting and proper that the catering agency must provide its client with a professionally crafted baptism menu that will guide them on what food or dish to choose considering their budget. 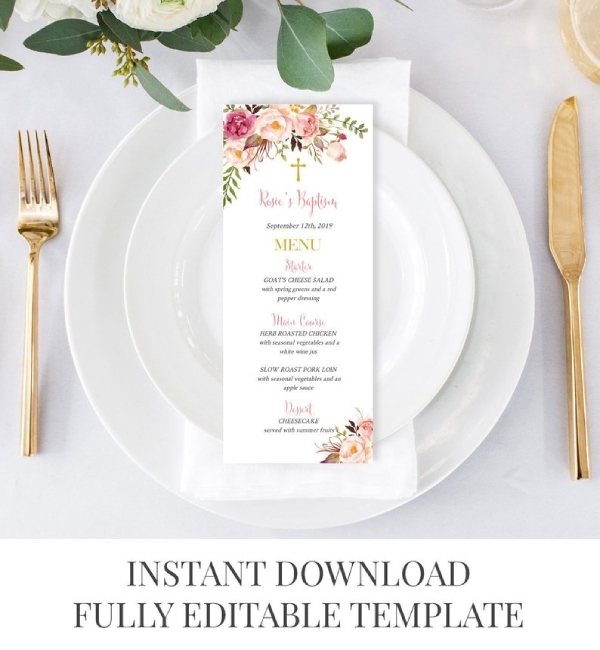 To help you with your menu, check out the templates and examples below. 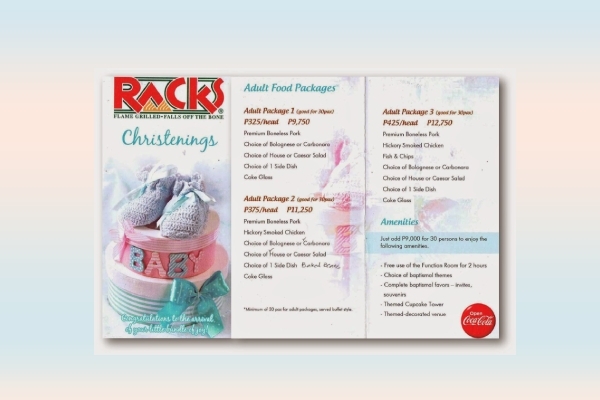 Perfect for boy baptism, this menu will serve as a guide for your guests on the food that will be served. This will also help the visitors build anticipation as regards the food and even serves as a warning in case they are allergic to some food or there are certain ingredients on the dish that they must not consume. 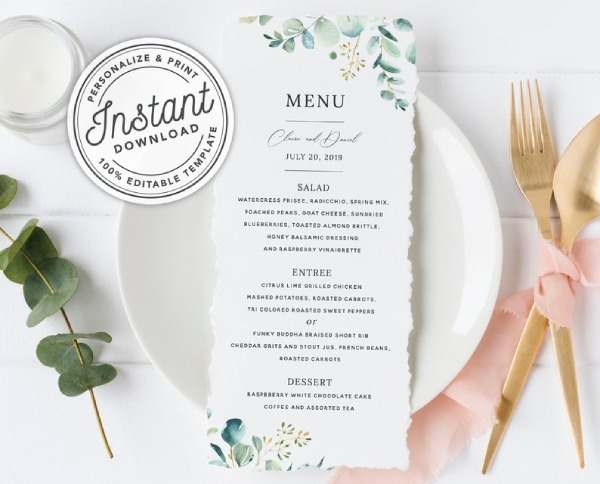 Hence, if you create your own baptism menu for your guests, make sure that you provide the necessary details or a brief description of the food. You must not only be concerned with the design but also be mindful of the content in your menu. This floral wreath baptism menu is what you perfectly need when you want to have an idea on how to create an appealing baptism menu. Inform your guests beforehand on what food will be served so they will know what to expect. You can list down the main dish, side dishes, desserts, drinks, among others. 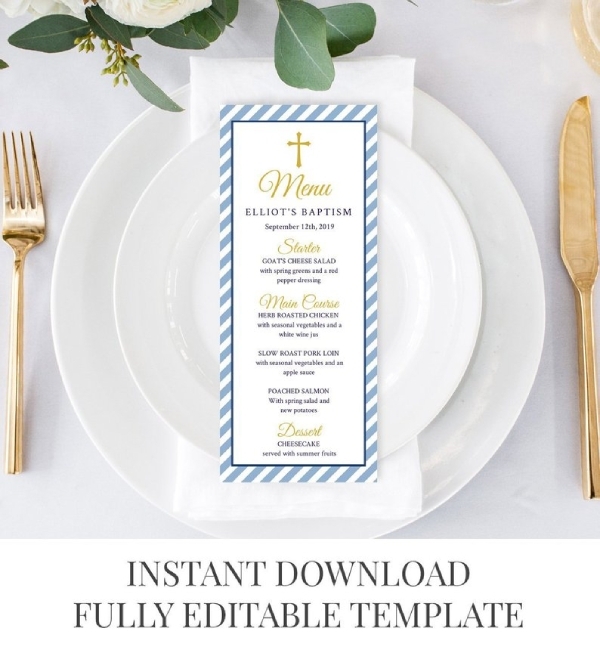 Just like this menu example, you can incorporate design elements that are appropriate for the theme of your baptism, but just make sure that the text in your menu is still readable and the first thing that will catch the reader’s attention despite the heavy design. After the baptism ceremony, guests would usually expect a meal afterward because this has become customary in every baptism. 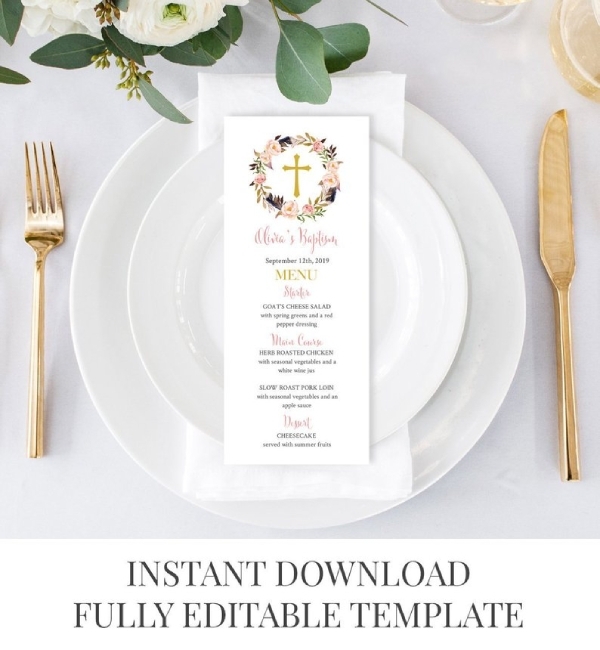 Hence, provide your guests with an elegant baptism menu, similar to the one presented above, and let them know the food that you will be serving. Moreover, apart from providing the guests with the list of food, a menu will also serve as a decoration on the table for a more sophisticated and formal look of the venue of the event. Besides table cards, another thing that you can place on top of the table in a baptism event is the menu. As stated above, this will also serve as a decoration which makes the event more decent, proper, and formal. Usually, large gatherings and celebrations would place a menu on the table, informing the guests about the food that will be served later. The guests can therefore pick what to eat and disregard those food that they do not want or they are allergic to. 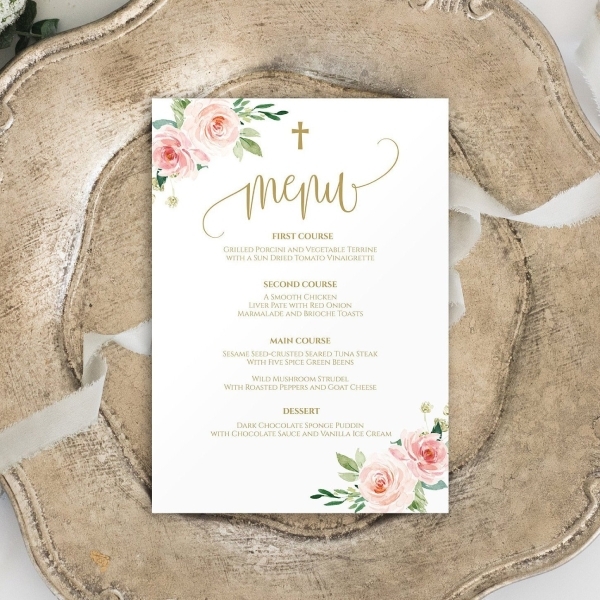 Watercolor illustrations are also among the common designs that are appropriate for a baptism menu. 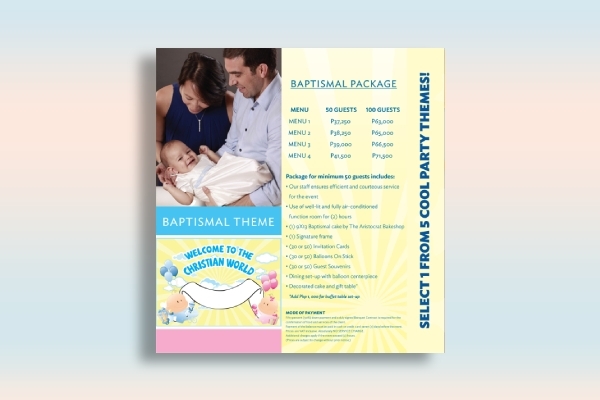 While you are working on your design, you must also make sure that your baptism menu contains the important elements that must be present in a menu such as the name of the baby being baptized, date of baptism, and list of food to be served. A brief description of the food will also help the guests in choosing the food that they want in their plates. While baptism and christening are two words that are usually used interchangeably, there is a slight difference between the two. Technically, christening is reserved for a baptism of infants, while baptism is a general term used for a Christian rite of admission into the Christian church whether the one being baptized is an adult or an infant. Having this in mind, when you offer catering services to the public, you must consider the food choices that you provide to your client. Give them different options for your event menu so they can choose the best deal not only considering whether the baptism is for an infant or an adult but also considering the budget for the whole event or celebration. The family of the individual being baptized is usually concerned about the food in the baptism celebration. With this, they surely need a caterer who would aid them regarding the food and venue preparation. 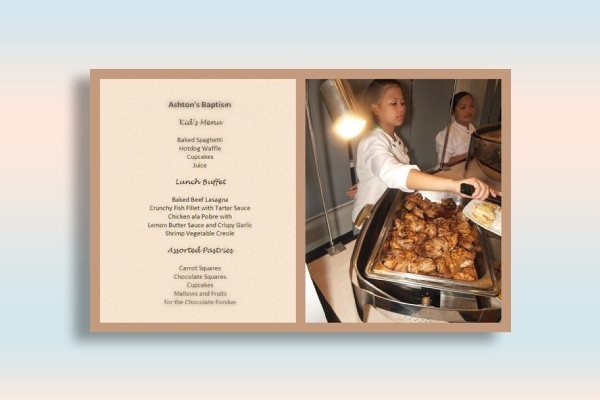 In order to provide your offers to this market, you must give them options and packages with different rates, such as this baptism buffet menu. Thus, make sure that you include the necessary details in your menu such as the respective prices for each package as well as the inclusions of the package, such as main dish, desserts, drinks, etc. Catering service providers must give their customers the best baptism menu that they can offer in order to make these clients long-term and loyal customers that will patronize their services. Every client is an opportunity for the company to grow and be known in the market for he or she might relay your great offer to their family, friends, and colleagues. 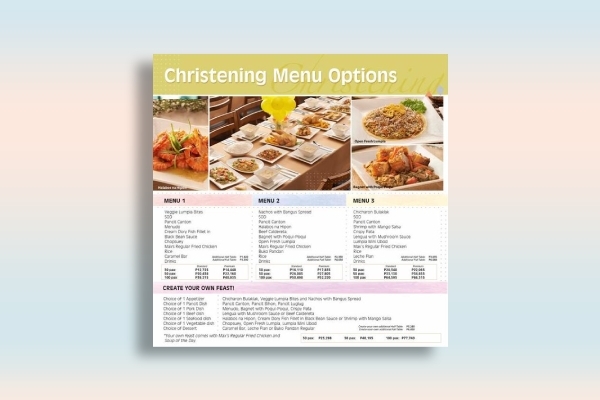 With this, you must ensure that your menu is well-designed and well-crafted, such as the menu design above, and includes your contact information so that potential clients can easily communicate with you if they have questions, orders, and other related concerns. Running out of creative juices for your baptism menu? The baptism dinner menu above can surely help. If you are into providing catering services to your clients, you must know the basic thing in making a menu. You have to note that while your offers and great deals will make people interested to avail of your services, your design is the first thing that will catch their attention. Hence, you must put extra effort in your design and include high-quality graphics and illustrations. 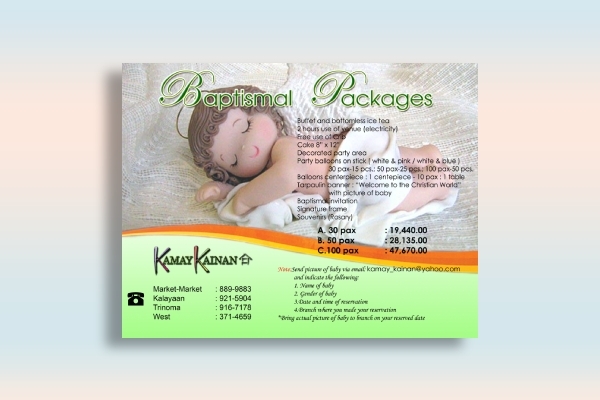 Give your clients several options for the baptism menu packages that are available for purchase by referring to the example above. Create a list of the available options as well as the inclusions for every package. Do not forget to ask the client the specific number of guests, or at least an estimated amount, so you can provide an option that is most suitable for their needs.